Chengdu, the provincial capital of Sichuan Province in China, is more often known as the place to visit the famous Giant Panda bears. 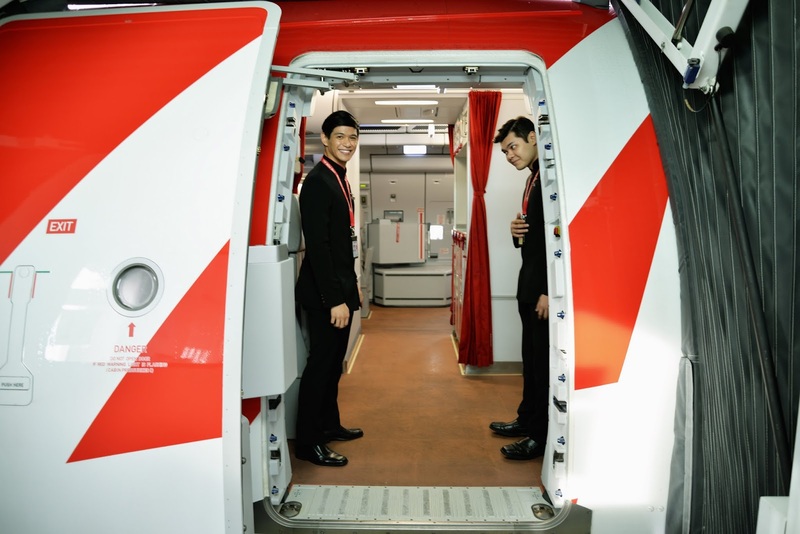 It’s my first time travelling to China, courtesy of Air Asia X and Dorsett Grand Chengdu and I was super thrilled to the max. To be able to travel and learn about other countries and their heritage and cultures is indeed a precious and priceless excursion. 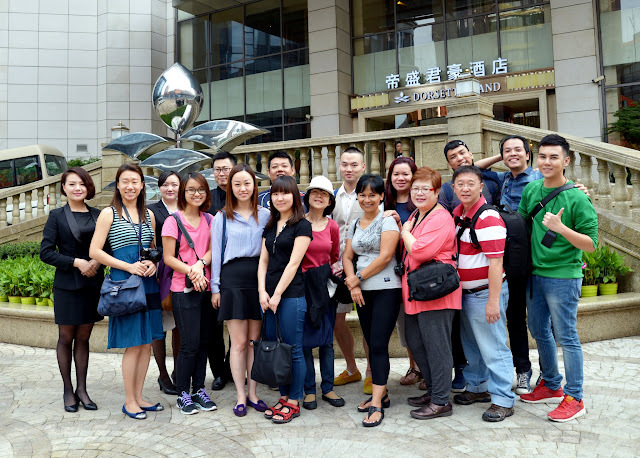 Our five day escapade was filled with an amazing experience of the richness of Chengdu from all aspects of life. There’s more to Chengdu that meets the eye. It even has a list of nicknames from Heavenly State, The Brocade City, The City of Hibiscus and Land of Panda. Chengdu is the gateway to many amazing places in China. One of the more popular places to visit in JuiZhaiGou, a world-acclaimed tourist spot, as it has the most breathtaking sceneries in China. Chengdu also has a rich history from its many dynasties ruling as well as a haven for the renowned spicy-numbing Sichuan cuisine. You can read more about Chengdu here. Our escapade kicked off with us taking Air Asia X (AAX) which has a direct flight from Kuala Lumpur to Chengdu in the evening. 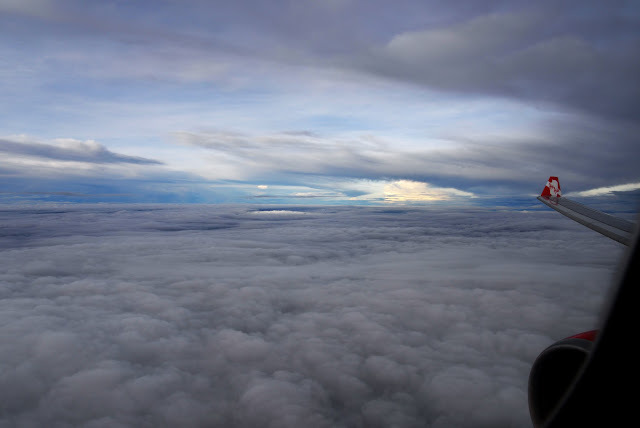 AAX flies seven times a week from KL to Chengdu with a four hours and fifteen minutes journey and lands at the Shuangliu International Airport. 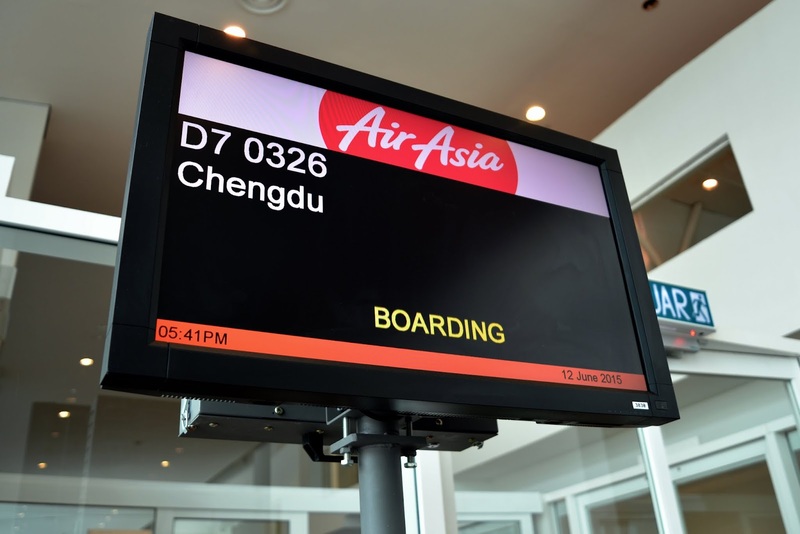 Flyers with AAX will be please to know that they can opt for the Air Asia X Quiet Zone for a peaceful flight to several destinations with Chengdu included. 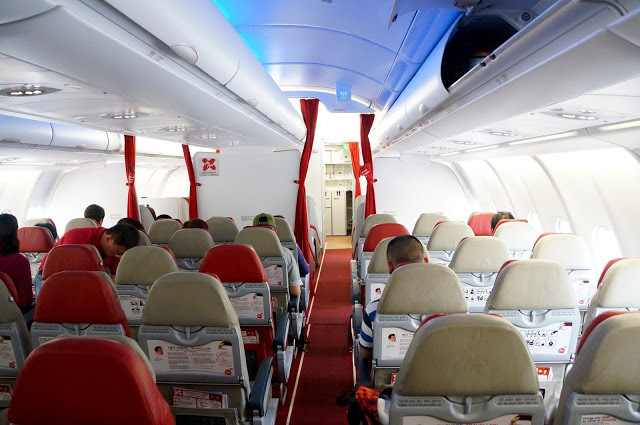 This Air Asia X Quiet Zone is located after the premium flatbed cabin and offers flyers a comfortable and quiet ambiance with minimal noise or disturbances. 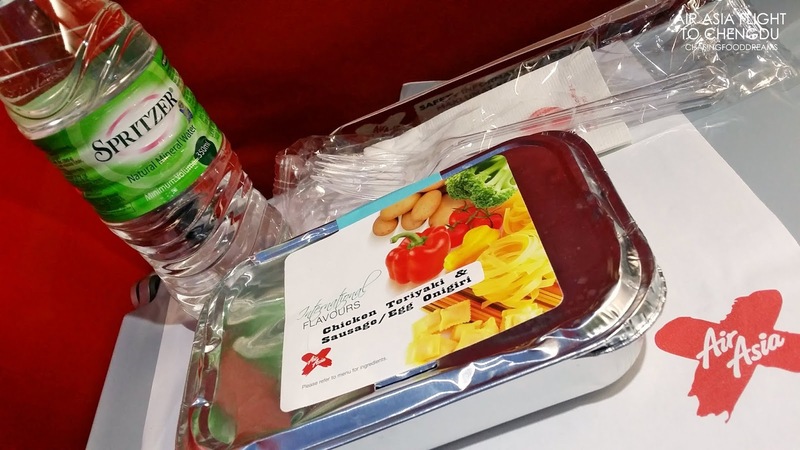 The zone is only available to flyers aged 10 and above and meals will be served faster as well compared to the regular economy zone. 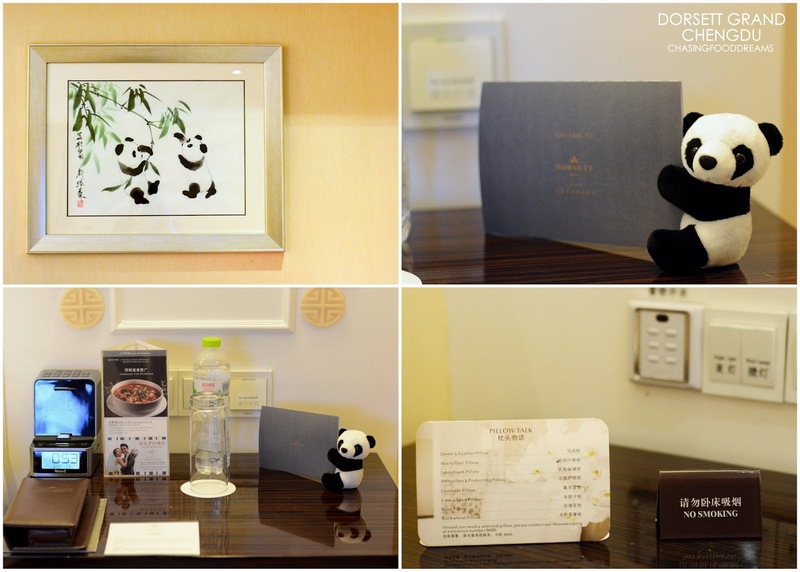 We arrived late in the evening at Chengdu and checked into Dorsett Grand Chengdu for the trip. 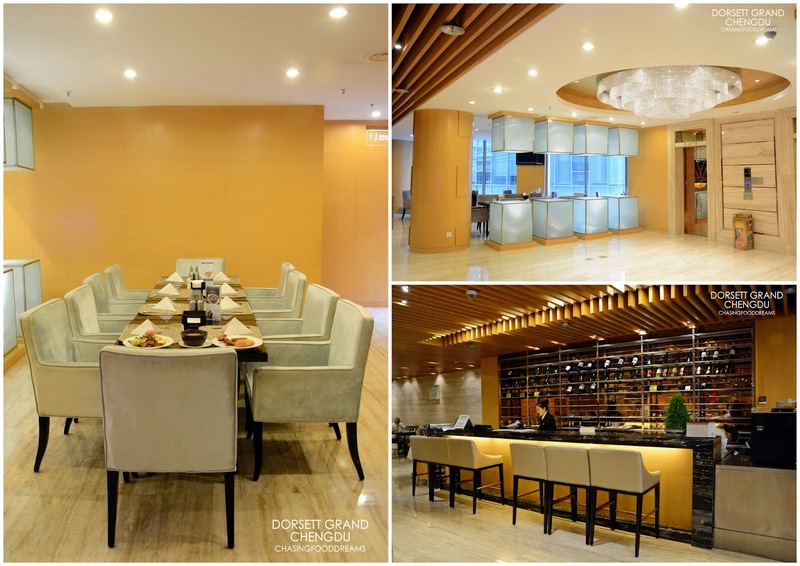 Dorsett Grand Chengdu is a five-star hotel located in the bustling historical Luoma Market area in Chengdu’s Central Business District. The 556 guestrooms and suites hotel is impressive at sight when we enter the lobby. Spacious and fitted with marble everywhere from wall to floor, the lobby also has impressive high ceiling be fitted with opulent chandelier of a blooming flower. Grandeur with elegance best describes the ambiance at the hotel! Wall panels are also decorated with striking copper colored panels with lotus and gingko leave motifs. 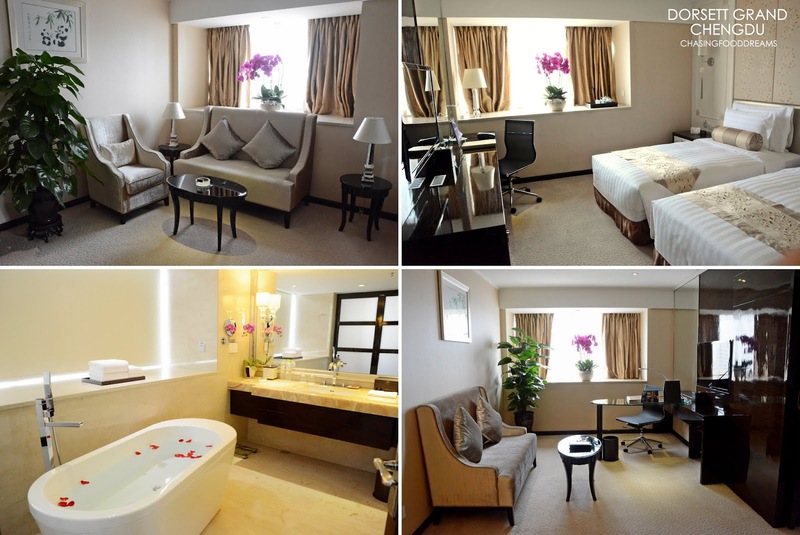 We checked into our rooms respectively and mine was Dorsett Room with King sized bed located on the seventeen floor. The room was dressed with minimal but elegance décor. Finished with a mix of contemporary and elegant fittings with touches of Asian theme, my room was spacious and comfortable at sight. The neutral warm colors made the room serene and elegant. 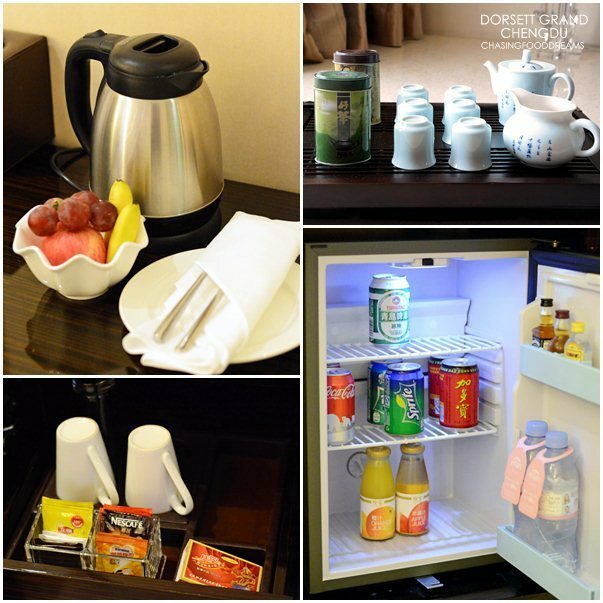 There is also the usual mini-bar, coffee and tea treats as well as Chinese tea set, plenty of bottled water refilled each day as well as an electronic safe. Did you know that Chengdu is famous for tea houses? Inside the ornate cabinet, there’s plush bathrobes and slippers for comfort. The bathroom is very spacious and has a glass enclosed shower fitted with rain shower as well as the regular one. Long baths are considered a luxury these days and I certainly had a few good soakings during my stay. 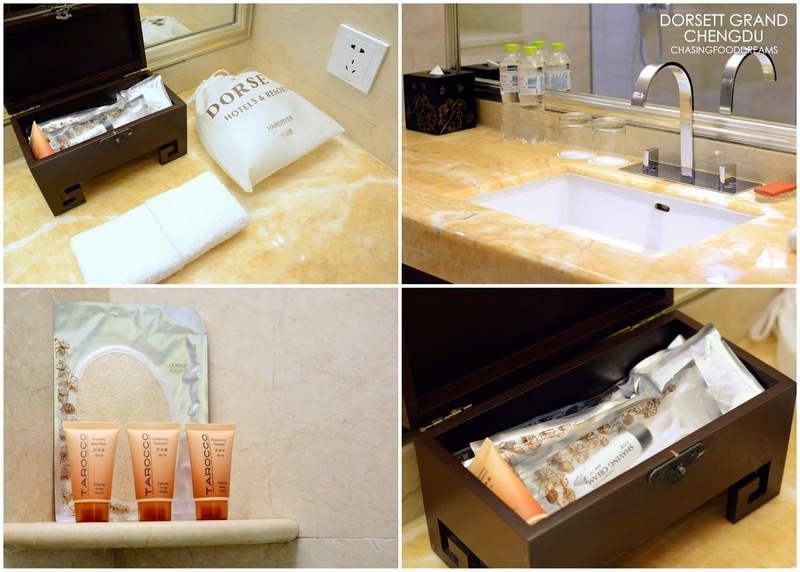 There is full range of bathroom amenities for extra pampering. All rooms features a bay window with a view of the bustling city. 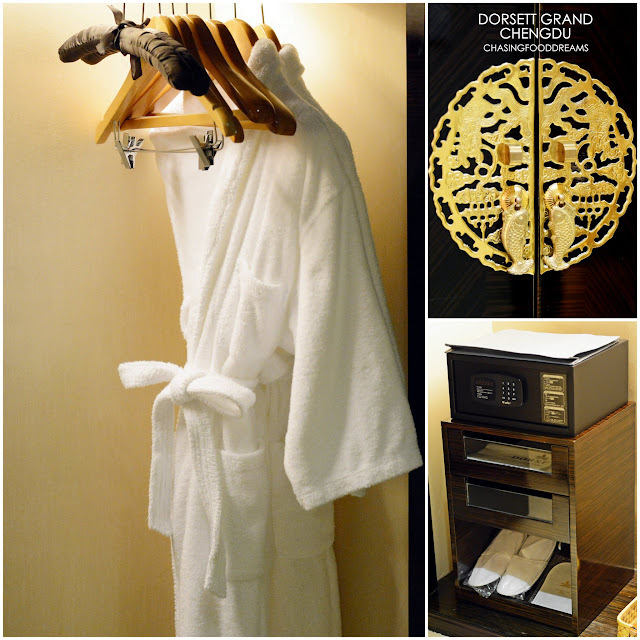 Dorsett Grand Chengdu has other room categories such as Deluxe Room, Dorsett Suite, Executive Suite and a grand Chairman Suite. We had a hotel tour and here are some of the rooms as options. If you are aiming for more luxury, go for the Suites as these have separate bedroom and living room as well as a bigger bathroom with shower and bathtub as well. The separate living room area has plush velvet sofas with separate office space as well as entertainment space. On another hand, if you are going to go all out and enjoy the ultimate luxury living, you might just be looking for the Chairman Suite located on the highest floor of the 42-storey hotel. There are two plush bedrooms, one with king sized bed and the other with twin beds, beautifully furnished with stylish furniture, wall panels and ornate lightings. The separate bathroom is very spacious with its own Jacuzzi, massage room, sauna and steam room facility. Just right outside the master bedroom is the separate stylish workspace filled with dark wood office desk and leather seats as well as marble flooring. The large living room space has elegance written all over with its modish chandelier, velvet covered sofas, marbled table, a fireplace, huge tv and wall to ceiling plasters. The Chairman Suite has an elegant dining room with a modern chandelier which I really love a lot. It has its own kitchen space for entertainment preparation. Indeed a Chairman Suite made for anyone who enjoys living life in pure extravagance! 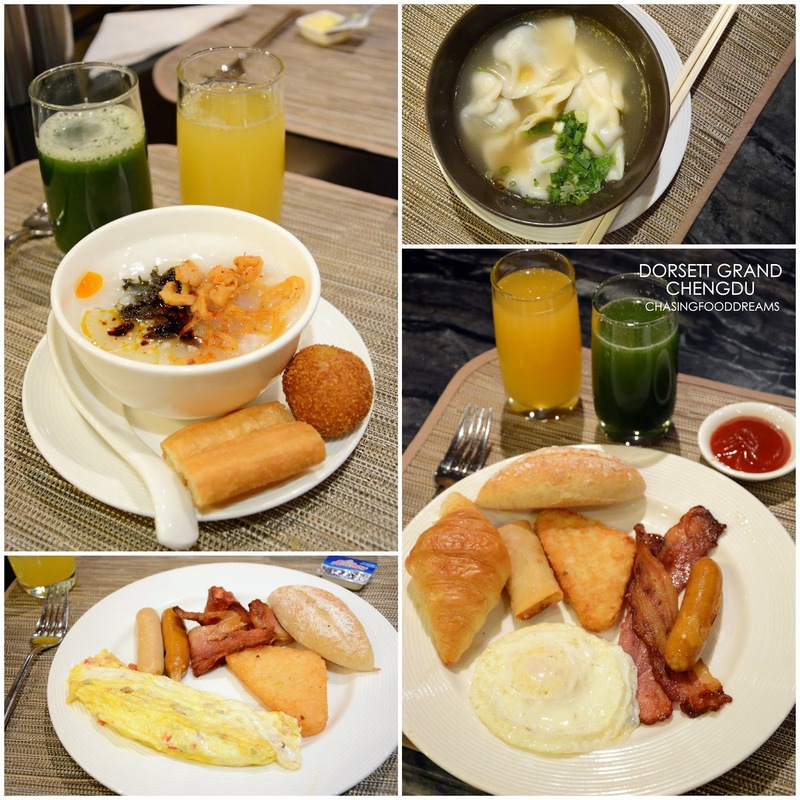 For breakfast in the mornings, we visited Yue Rong Café located on level 2 each day. Open as early as 6.30am, many are already seen enjoying the large spread of breakfast buffet filled with lots of delicious breakfast treats. 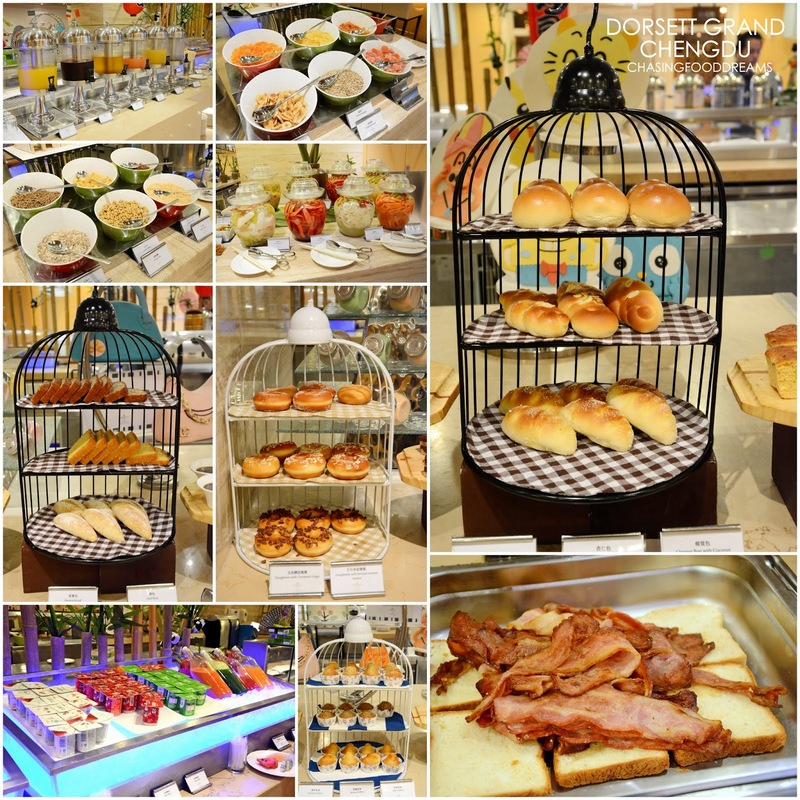 I was in awed of its spread of tempting bread and pastries as well as the large spread of fresh fruits, fruit juices, yoghurt, cheese plus coffee and array of teas for light meals. I also had porridge with classic Chinese condiments of pickled vegetables, fried Yau Cha Kwai and fried treats. There is also a noodle bar with various noodles and dumplings. At Dorsett Grand Chendgu, you eat breakfast like a king! Yue Rong Café also serves lunch menu. 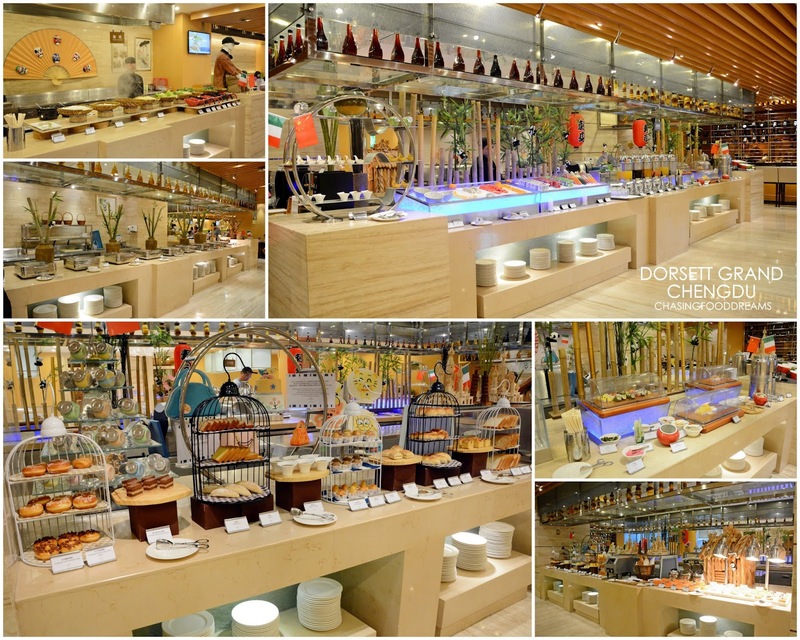 For full-fledge dinner, Dorsett Grand Chengdu has Fu Yue Xuan Chinese Restaurant serving Canton and Sichuan cuisine so stay tune for this in my next post of Where to Eat in Chengdu! There’s also the Lobby Lounge for light snacks and drinks available throughout the day. Dorsett Grand Chengdu’s Grand Ballroom is opulence and fits up to 486 persons, perfect for business and private functions. There are 11 Individual Function rooms as well for smaller parties. 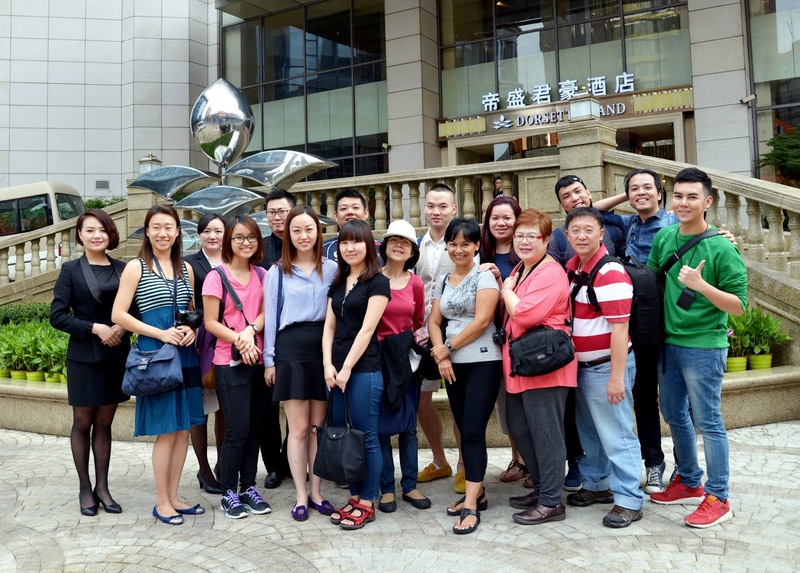 We can’t wait each day to explorer the city of Chengdu. Another thing I admired at sight was the usage of electric motorbikes and bicycles which is environmental friendly, leaving the air at Chengdu better than most cities I have been too. 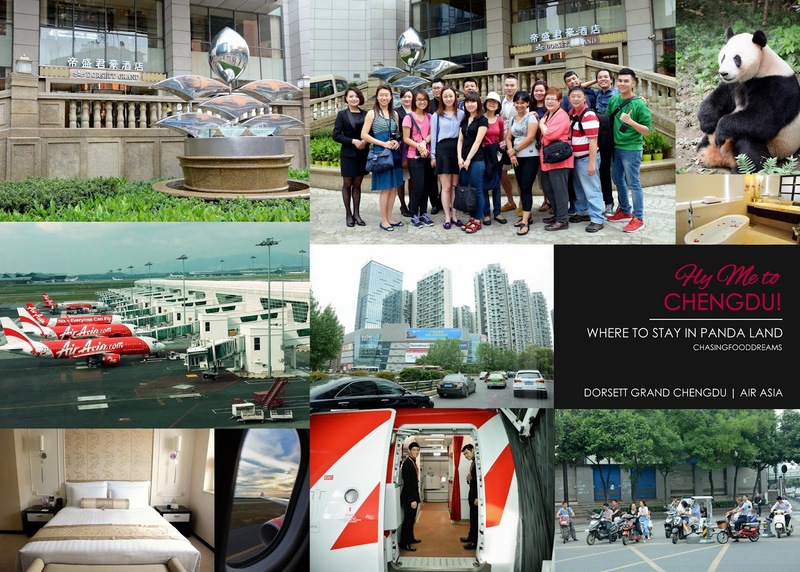 So if you are thinking to travel to Chengdu, do check out Air Asia X for the direct flight at affordable prices and a comfortable stay at Dorsett Grand Chengdu. The hotel is within distance of some of the neighboring bustling downtown shopping area as well as public Metro transportation. 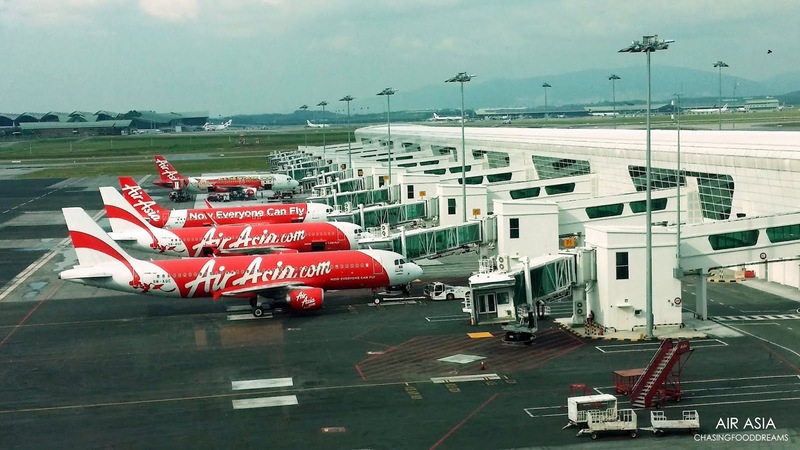 For more details on AIR ASIA X, visit their website here. I really like that street shot, hope to see more of the streets of Chengdu in Part 2, or the street food of Chengdu ! LOL.